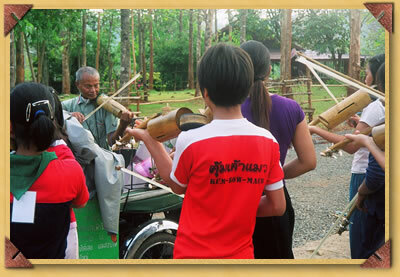 An old man shares his musical knowledge and wisdom with some of the children, contributing to the preservation of traditional Thai culture and values. Amicus’s primary goal, in working with Children’s World Academy, is to create a program that will serve as a model for community development for people who are at risk or who have very limited resources. Amicus and Children’s World Academy have an affinity for ideals concerning social responsibility and environmental awareness. Amicus is also concerned with the sharing of skills, knowledge and experience between the elderly and young people, thereby creating an intergenerational village.